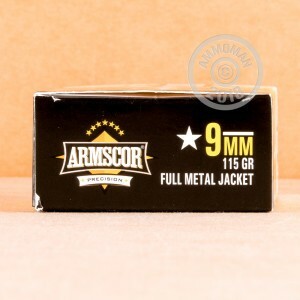 These 9mm Luger rounds from Armscor are a great choice for high quality range training and target practice. Featuring 115 grain FMJ projectiles, these rounds are loaded into boxer primed brass cases that can be reloaded. Armscor ammo is loaded to meet SAAMI or CIP specifications and has a reputation for being both reliable and affordable. 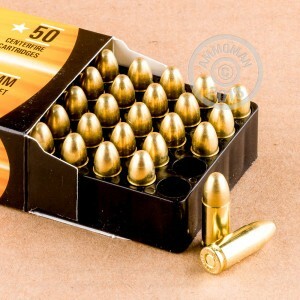 This 1000 round case is perfect for volume shooting at the range! Armscor was established back in 1905 in the Philippines. They later acquired Rock Island Armory and started selling their products in the United States in 1985. Their USA line of ammo is loaded here in America while their Precision line is manufactured at their Philippines headquarters. At AmmoMan.com all orders over $99 will ship for FREE! 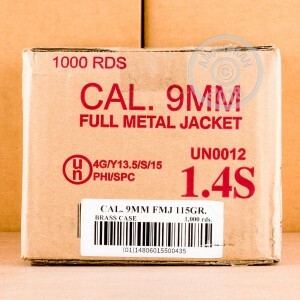 So pick up this 1000 round case of quality 9mm ammo today and the shipping is on us! Have not fired it yet but please note comment below. The description references USA loading with Precision line from non-US. I thought I was buying US made AMMO, the box clearly stated made in the Philippines. I'm sure I will like the product, would prefer a better description, thank you. Shot around 4 thousand no failures still haven't cleaned the gun. no misfires in my glock 17. Great cheap rounds, that I'll definitely purchase again. This ammo is great for the range. Yes, a little smoky, but our range has exceptional ventilation, so no problem there. I fired a couple hundred rounds, had one malfunction at the end of my session, so the gun was pretty dry by then. But overall, this ammo works great for me. Then I don't have many problems at all with the S&W M&P Pro-Series C.O.R.E. Any ammo works well in this gun. brought 3 newer pistols to the range: HK VP9, SW MP Shield, Ruger LC9s. They were spotlessly clean. All three pistols had MULTIPLE jams with this ammo. The LC9 stopped firing entirely. I am very disappointed with this 9mm ammo. I would venture to say that I am totally disgusted! I have to go back to Ruger with a brand new pistol and wait to get it fixed - may need a new striker. The HK had had never jammed before this. I am trying to figure out what I will do with rest of this ammo. I don't want to put it through our guns. have ordered this and a few others, Beretta and glock chew this stuff up with no issues. Got it at a great price. Runs flawlessly in my Walther PPQ. A little smokey, but not too bad. Put a box through no issues, stored the rest.